This volume and its companion Volume 1 chronicle the proceed- ings of the International Symposium on Micellization, Solubiliza- tion, and tficroemulsions held under the auspices of the Northeast Regional Meeting of the American Chemical Society in Albany, New York, August 8-11, 1976. The technical program consisted of 48 papers by 91 authors from twelve countries. The program was divided into six sessions, and Dr. Hartley delivered the Concluding Remarks. Subsequently, six more papers were contributed for the proceedings volumes with the result that these volumes contain Sl papers (three papers are not included for certain reasons) and are divided into seven parts. The first three parts are embodied in Volume I and the remaining four parts constitute Volume 2; each part is followed by a Discussion Section. Dr. Hartley's Concluding Remarks are in- cluded in both volumes. When the idea of arranging a symposium on micelles was broached to me, I accepted it without an iota of hesitation. I had two op- tions: either to make it a one- or two-sessions symposium, or bring together the global community actively carrying out research in this area. I opted for the latter as the subject was very timely and I knew that it would elicit very enthusiastic response. 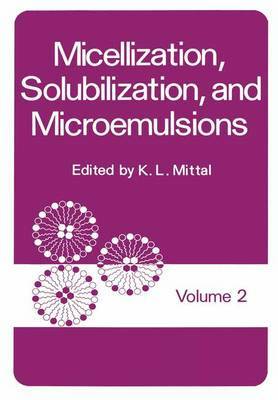 In order to broaden the scope of the symposium, I suggested that the theme of the symposium should be Micellizationy Solubilization and Microemulsions.